Tahmina, 1 year 4-month-old female 4th issue of consanguineous parents of low socioeconomic background hailing from Kishorganj admitted to Dhaka Medical college hospital through emergency department with the complaints of repeated convulsions since 3 days of her age that is aggravated for the last 1 days despite her usual medication. 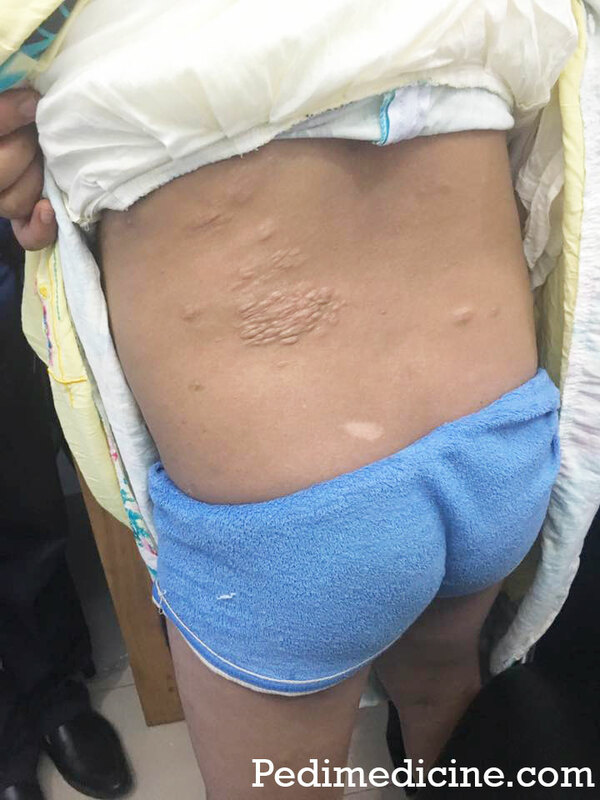 According to the statement of her mother, the convulsion was initially limited to right arm then became generalized without any bowel and bladder involvement. On query, the mother also told that the convulsion is afebrile lasting for 2-5 minutes and in between convulsions she is conscious, oriented, playful and it does not hamper her feeding. Mother also gave the history of multiple whitish patches initially over the nape of the neck then appeared over different parts of the body. 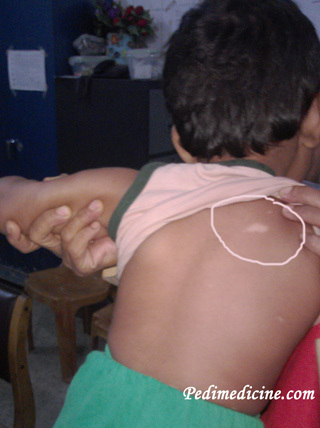 For this complaints, she got admitted to DMCH and treated accordingly at the age of 1 month. The mother was in regular antenatal check up and there were no complications like gestational diabetes mellitus or hypertension. The baby is born by normal vaginal delivery at home without any complications at full term. There was no history of fever, jaundice, delayed crying or vomiting. The baby was in exclusive breastfeeding until 6 months of age and later complementary feeding was added and now she is in the regular family diet. The child reached to developmental milestones at the expected age. She is immunized as per EPI schedule. She is currently taking anti-convulsive drugs for her illness named by Syp. Anleptic (Carbamazepine) and Syp. Valex (Na Valproate). There was no history of maternal illness during her pregnancy, no history of taking offending drugs, or no previous abortions or stillbirth. The drinks boiled water, lives in a paka house, use sanitary latrine. Other family members are healthy. On examination the baby is conscious, not convulsive, vital parameters are HR-98/min, RR-26/min, Temp-99*F, not anaemic or cyanosed. BCG Mark is present on the left arm. Anthropometric measurements are within normal limits. Examination of ear nose throat reveals no abnormality. On skin, survey reveals 18 – 20 hypopigmented patch of variable size and shape over different parts of the body such as the forehead, trunk, nape of the neck, back of the chest, thigh etc but absent in axilla, inguinal region or lumbosacral region. Fundoscopy was not done. On nervous system examination, the baby is well alert, conscious, higher psychic functions are intact, cranial nervous system examination reveals no abnormality, motor functions are normal, the planter is flexor bilaterally, reflex normal on both sides, sensory functions are intact. There are no signs of meningeal irritation. Other system examinations reveal no abnormality. CT Scan report and EEG report are provided by the patient’s party done 1 year ago. CT SCan Report: Brain Parenchymal calcification’s in left basal ganglia and right frontoparietal regions. EEG Report: Focal epileptiform discharges. 3. Baseline investigations for assessing other organ involvement. Tuberous sclerosis complex (TSC) is a dominantly inherited, genetic disorder affecting cellular differentiation, proliferation and migration early in development, resulting in the development of tumours in multiple organ systems, often referred to as hamartia and hamartomas. The name arises from the potato stem-shaped growths that occur in the brain, also known as tubers. Facial angiofibromas or forehead plaque. Nontraumatic ungual or periungual fibroma. Ash leaf shaped Hypomelanotic macules (>3). Shagreen patch (connective tissue nevus). Cardiac rhabdomyoma, single or multiple. Multiple randomly distributed pits in dental enamel. Cerebral white matter radial migration lines. Cortical tuber in CT Scan. Subependymal nodule in CT Scan. It was a previously diagnosed case. The reason of her recent seizures are discontinuation of drugs. The patients party got discharged after the initial treatment. We counselled the patient about the diseases and its consequences. Her family is unable to bear the cost of further investigations. This PDF contains the best discussions with pictures of Tuberous sclerosis. What do you think about the salient features of this patient? Need any corrections, addition or exclusion? Share your thoughts.